Arriving over seventy-five years after the original release of the classic animated version, this live action take on Dumbo occupies a unique place in the Disney canon. Having Tim Burton direct things, brings the film the individual look that Burton seems to have on-lock and it looks great, dark, but great. The story is expanded and now ends with a much bigger flourish. It also gives some of the actors the canvas to go big. In particular Michael Keaton, who has never been more hammy and over the top as the representation of the evils of big business, V. A. Vandevere. 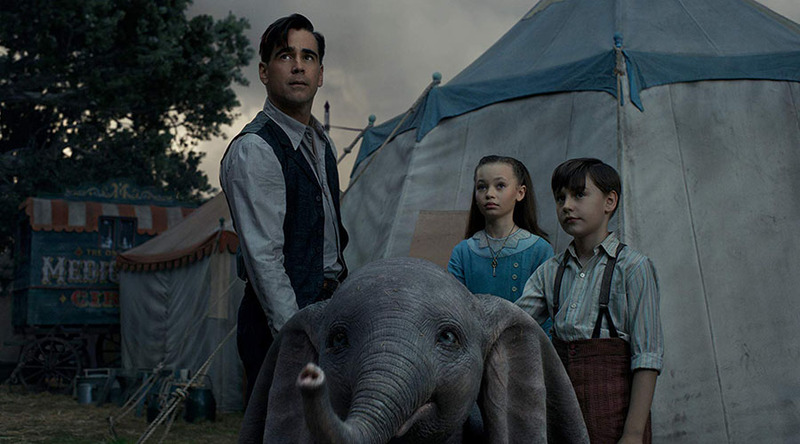 Colin Farrell as the returning World War One solider Holt Farrier, also gets to play a heroic father figure to his two young children played by Nico Parker and Finley Hobbins. The real star of the show is of course Dumbo and the animators do a great job of creating the baby pachyderm with the big ears. Of particular effect are his baby blues, they really translate emotion. Tim Burton and his production designer Rick Heinrichs and cinematographer Ben Davis combine forces to create a fantastical looking world filled with old world charm and an almost steam punk injection of futuristic technology. The most unique element of the film is its limited accessibility to different segments of the audience. Despite it being a Disney production and being based on a very youth friendly origin, it is quite dark, visually and thematically and that might be a bit much for the very youngest members of the family. Many, including this reviewer, will see this as a plus, as it doesn’t adhere to the old one-size-fits all Disney ethos.